We've created "My MPG" to help you calculate and track your fuel economy and compare it with EPA test ratings. You can also share your MPG with other users. 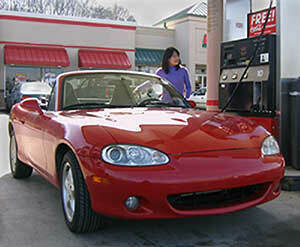 Question of the Month:What factors affect fuel prices? Answer: When gasoline and diesel prices spike, we often want to blame someone for our pain at the pump. The reality is that the oil industry is a complex market. Though there are numerous factors that could ultimately influence the price of fuel, such as weather, government policies, and international relations, there are four factors that have the most significant influence. These factors include the cost of crude oil, refining costs and profits, distribution and marketing costs, and fuel taxes. Alternative fuels, such as natural gas, propane, electricity, and biofuels, can mitigate some price fluctuations attributable to short-term events, like natural disasters, because they diversify the fuel supply; however, some alternative fuel prices are also dependent on similar factors. May Question of the Month! Answered!